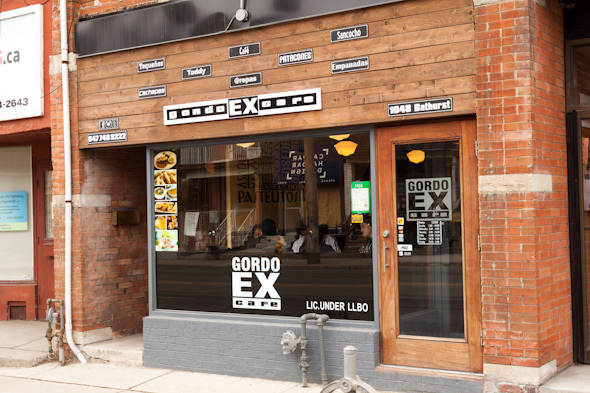 Gordo Ex Cafe has been open for over a year on the up-and-coming Dupont and Bathurst strip, which includes the wonderful Annex Pawn and newcomer Sugary Swirls . 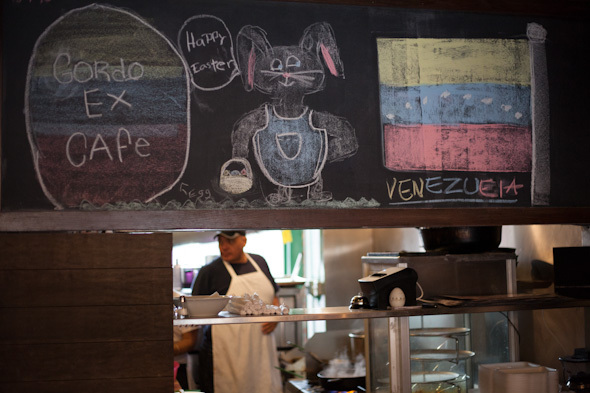 Perhaps its vaguely Brutalist name doesn't file away in the brain so well, but quiet praise for Gordo Ex has been making the rounds for a while now: tasty, affordable, and overflowing, this modest Venezuelan stopover does comfort food right. To save room for an arepa, which would normally be more than enough for a meal, I nibble on some mini portions of their signature offerings. 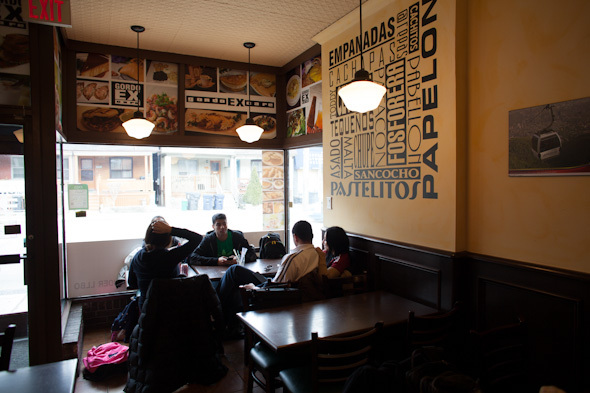 The tostones playeros ($7) are a Latin American specialty: discs of unripe plantains fried until golden brown. The almost-starchy crisp is nicely balanced with fresh shredded cheese, cilantro bits, and a spicy dressing. A kick-start to the palate, I'd come for this item alone. Tequenos ($1.75 each) - basically a Venezuelan mozza stick, but filled with their in-house cheese - are a big hit. Regulars often stop in for a quick fix of these cheese horns. Given that it was Venezuelan cuisine, corn was a common motif. Case in point: the made-from-scratch beef empanada ($3) gets just enough bite from its maize-flour shell. 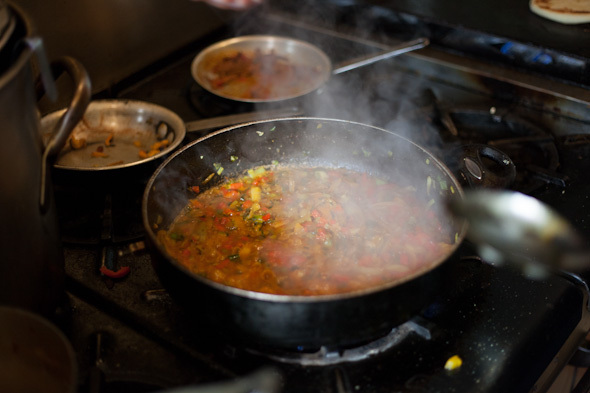 The beef filling also contains sautĂŠed scallion, garlic, bell peppers, and adobo-like seasonings. 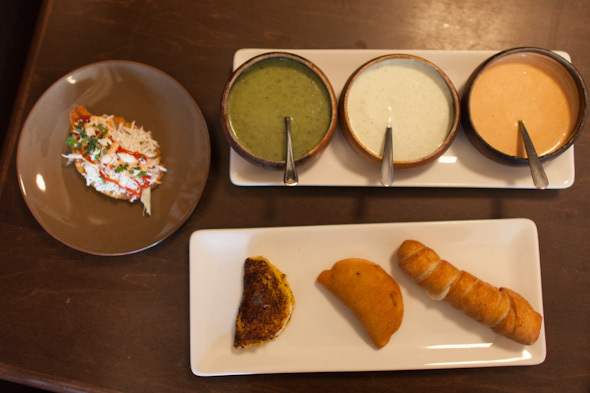 If you forgo the arepa and simply tic-tac-toe these three menu items alone, you'll have treated yourself well. But whatever you end up ordering, you'll be making short work of their complementary sauces: traditional avocado, garlic, and chipotle, respectively. 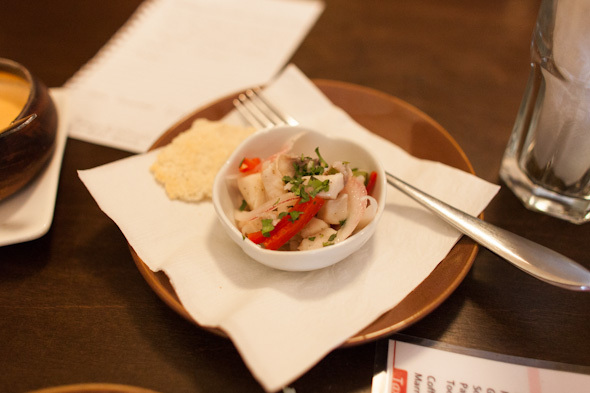 I also have a few bites of their ceviche ($12). Coming on strong, the red onion is a bit coarse and overpowering, but the lime preserve is subtler, allowing the delicate texture and refreshing flavour of the tuna to breathe. To round out the mini tasters, their cachapa con queso satisfied the sweet tooth. Made from fresh corn, the patty folds in a sweetened version of their cheese inside. Flavour and texture-wise, it's reminiscent of cannoli. 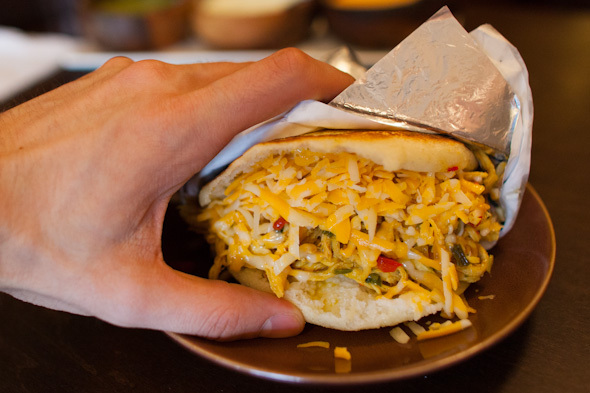 If I had to choose one crowd-pleaser at Gordo Ex, hands down, it'd be their arepas - a Venezuelan sandwich. The arepa bread is a simple mixture of white corn flour, water, and salt, but boy is it grilled to perfection - thick, bready, and crispy. I stick with the traditional chicken version ($6.75), which features strips of white chicken sauteed with mixed bell peppers, onions, garlic, and saffron. The mixture is cooked down as not to be too juicy, though I imagine the arepa dough would hold up anyway. After the filling gets looked after, it's then loaded with shredded cheddar. Wrapped in foil, this pocket of hot, gooey goodness is about the size of a large burger, and may be even more filling. They also do non-traditional arepas ($7.75) such as their vegetarian version, which has fried plantains, black beans, house cheese, tomatoes, and avocado.